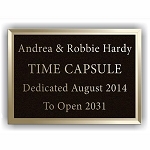 What wording is best on a time capsule plaque? 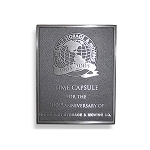 What wording do you use for engraving a time capsule? The answer varies because it is up to you to provide that all important message to the future. Below, we have some examples. 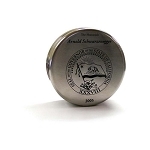 Both plaques and engraving can accommodate logos, but the artwork needs to be in vector format. 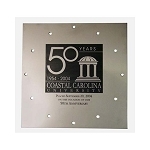 Plaques, because they involve pouring of metal into molds, or metal forming, has strict requirements for letter size and spacing in between lines and letters. All capital lettering takes up less space than lettering that includes both capital and lower case lettering, oddly enough. It is the size of letters overall that is important. Letter height must be at least 1/4 inch if all capital letters and at least 3/8 inch for cap & lower case. 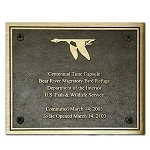 As for size, your wording just needs to fit on the plaque size you choose. Sometimes we can use condensed lettering to make your wording fit - but not always! 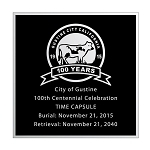 capsule during the year 2065.